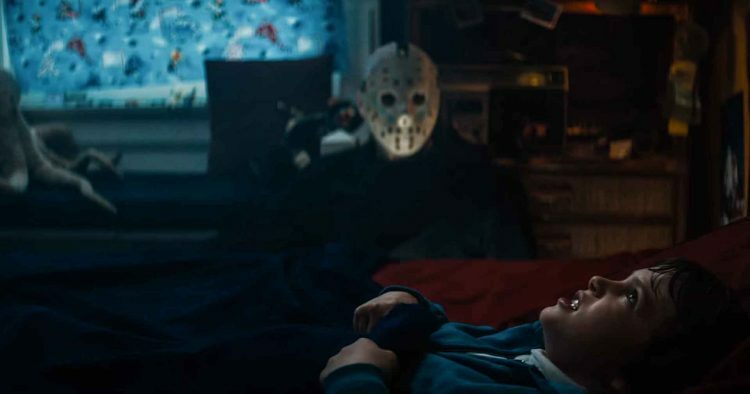 Every Friday the 13th Fan Will Love this Music Video! Every now and then someone comes along and creates a homage that truly represents the source material and properly pays loving tribute to it! Friday the 13th part 5: A New Beginning is often better known as the one with a fake Jason in it. The movie is one of the most mean spirited and unique entries into the Friday film series but its maligned for its Jason impersonator that’s going around killing teenagers. Yeah he wears the mask but in the end its just some guy who wanted revenge and took up the machete and Hockey mask to get it. But I’ve always have been a bit of a fan of Friday 5 so it really warms my heart to see this amazing music video by the band Wolfie’s Just Fine, aptly titled, ‘A New Beginning’! Its a song and video that I imagine most horror fans can totally relate to. That first time you watched a horror movie and the fear, shame and excitement you felt from seeing something so bloody and overtly sexual! I think this extremely well directed music video truly captures that ‘First time’ for a horror fan! Check it out below!